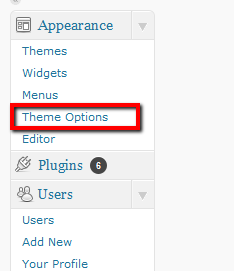 The Theme Options page in the wp-admin dashboard is your Control Central for everything in the theme. It is found in Appearance -> Theme Options. It is critical that you become comfortable with it and are aware of it’s many settings. All of the settings include a description of what they do. If anything is unclear or confusing, please don’t hesitate to contact me. Includes settings for color scheme, Logo settings, and some critical settings that must be set or the theme won’t work. Includes all the settings for controlling the behavior of the Slideshow on the homepage. You can control the transition effect, number of items to show, the order of items, exactly which items show, and more. Includes all the settings you need for setting up your Twitter, Facebook, and other social networking sites. Settings to hide or show elements/features of this theme. For example, if you don’t use Twitter, you can “hide” it from the homepage and the sidebar. Controls all the headings and labels used throughout the site. Handy if you don’t like my wording, or if your site is in a language other than English. Options for the “Browse by” section in the menu bar. Change wording of the menu items, include/exclude certain Browse By items, etc. Settings that didn’t find a home in any section above. Like Jpg quality, Google Maps API Key and lots more.